Alaska roads are on track for one of the deadliest years in the last decade, according to state officials who say the number of fatal crashes has sharply increased from last year. The state had seen 75 traffic fatalities this year resulting from 69 fatal collisions as of Monday, the Alaska Department of Transportation and Public Facilities said in a statement. That's a jump of nearly 34 percent from the 56 fatalities in 53 fatal collisions statewide by the same date in 2015. The increase comes amid a more modest nationwide increase in traffic deaths — up 10.4 percent for the first six months of 2016 compared to the same period in 2015 — based on data from the National Highway Traffic Safety Administration. Although no definitive cause for the national uptick has been determined, state officials suggested that a rise in Americans' driving mileage linked to falling fuel prices and "the proliferation of drivers using smartphones and other technology while driving" may be factors. Driving behavior was a factor in about 75 percent of fatalities in recent years, DOT officials wrote. Alaska motorists drove just over 5 billion miles in 2015, according to state statistics. Totals for 2016 aren't yet available, but DOT spokeswoman Meadow Bailey said the department is expecting an increase of nearly 5 percent, or more than 100 million additional miles. Alaska State Troopers spokeswoman Megan Peters said that troopers had responded to about 47 traffic fatalities so far this year, based on informal data. "That's way more than this time last year," Peters said. "This time last year there were (about) 32." Crashes that kill more than one person may be contributing to the spike, she said; in 2014, troopers responded to three crashes with three deaths each plus a single double-fatality crash, but only two double-fatality crashes in 2015. There have already been five multiple-fatality crashes this year, she said, including an Atka van crash in June that killed three, and a van crash in Petersburg the following month that killed two. 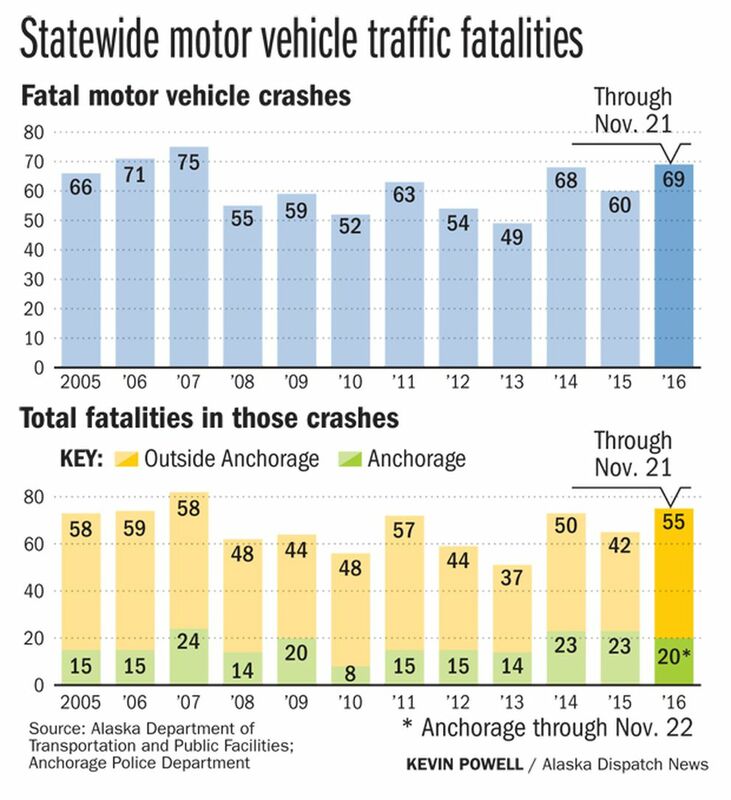 Anchorage Police Department spokeswoman Anita Shell said Wednesday that Anchorage's 20 traffic fatalities through Nov. 22 represented a slight decrease from the 23 in both 2014 and 2015 — although that marked a sharp rise from 15 deaths in both 2011 and 2012, and 14 in 2013. According to APD's traffic unit, officers have issued more traffic citations this year and responded to fewer collisions overall. "We are down slightly from the years past in the Anchorage area," Shell said. "Impairment, speed and seat-belt use are the top three contributing factors (to fatal crashes)." Bailey said that the DOT has lost 22 percent of its budget, or $60 million, to budget cuts since 2015. Those cuts have meant reductions in manpower for state road crews and some state roads being prioritized for snow removal over others. "Statewide, since 2015, we've reduced 55 equipment operator positions," Bailey wrote in an email. Although the department tries to maintain regular staffing, Bailey said the budget cuts have affected its ability to conduct extra work beyond standard hours. "We still maintain roads to the same standards that we did before," Bailey said. "We work shorter hours; we're not able to respond through the night; we don't have as much overtime ability." No specific factors have been blamed for the steeper rise in Alaska traffic deaths, but Bailey said the DOT has also seen an increase in crashes involving drivers not using seat belts, driving while distracted or impaired, and speeding. "Speeding actually is a huge one here," Bailey said. "It's probably more challenging in Alaska because you've got such varied conditions from week to week, but the posted speed limits are for perfect conditions — so we try to remind people to drive for the current conditions instead of the posted speed." 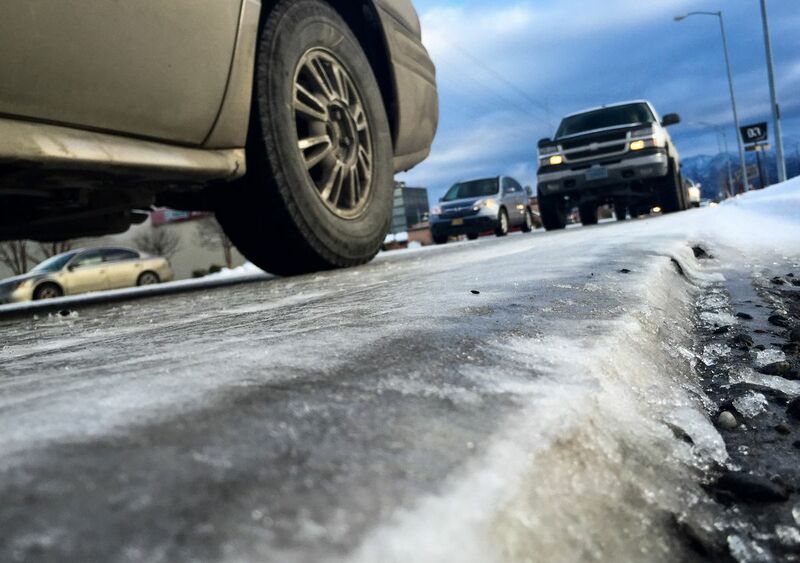 Warmer Alaska winters have changed road-maintenance procedures statewide — particularly in the Interior, where Bailey said conditions are currently "so slippery you can't drive the speed limit." One change road crews have made is sometimes using salt brine rather than salt or a mix of salt and sand on more crash-prone areas, such as curves, bridges and intersections. "Salt as a brine is actually less expensive; it's diluted as a solution, so it goes further," Bailey said. "Sand lasts for about eight vehicles — after that it gets kicked off to the side of the road." In Anchorage, DOT spokeswoman Shannon McCarthy said road crews weren't seeing much snow but have still been dealing with frost on area roads during morning hours. "When the road surface is super-cold, under 32 degrees, and then you have a nice warm day where there's sunshine, overnight you'll have condensation like a glass of water," McCarthy said. "You can have slick spots on a perfectly clear morning even where there's no precipitation, so make sure there's plenty of space between you and the driver in front of you." She also advised pedestrians to wear reflective vests or other materials, and urged drivers to keep a close lookout for people walking along area roads. "This is the time period when we have the most vehicle-pedestrian crashes; it starts in August, and November is one of the highest months," McCarthy said. "It's very hard to see pedestrians — there's not a lot of snow to provide contrast, and there's not a lot of light." In the long run, the DOT hopes to reduce traffic deaths by looking at what Bailey called the three E's: education of the driving public; enforcement of traffic laws, particularly in Alaska's highway safety corridors; and engineering for new highway projects. "Is this a trend that we're seeing or this an anomaly?" Bailey said. "Time will tell, but in the meantime we try to be proactive." The DOT is urging Alaskans to help reduce traffic deaths by using seat belts and headlights, driving for conditions, and not driving while impaired. In addition, drivers should leave plenty of room between themselves and road-maintenance or snow-removal vehicles. Information about road conditions statewide is available from 511.alaska.gov, or by calling 511.